The children and adults with FA are why we’re all here. They are the reason for the countless hours spent in the lab, the endless energy put into fundraisers, the reason we talk to anyone who will listen, and the reason we give. We do it to improve and to save lives. 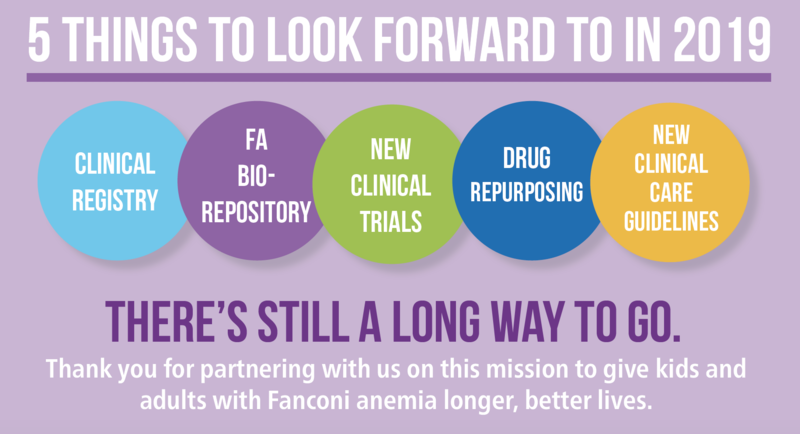 The research we fund impacts everyone with Fanconi anemia and goes on to benefit those in the general population who may battle cancer. That’s why the Fanconi Anemia Research Fund has been called the “the single best orphan disease research support group in the world” and “a model for demonstrating how a small group of dedicated families can speed the pace of scientific progress and bring real hope to patients with an otherwise-fatal disorder” by David Nathan, MD, President Emeritus, Dana Farber Cancer Institute. Read about our research. More than $23 million; 230 grants; 153 investigators; 74 institutions worldwide. When you give to FARF, you don’t just give to one institution or one project or investigator. Our research has a ripple effect and goes on to inform new researchers and projects. Each idea or concept builds on the others, taking us closer and closer to a cure. Many of today’s treatment protocols began 25 years ago as new research ideas funded by FARF. Check out our interactive map to see upcoming events as well as current research projects and clinical trials.